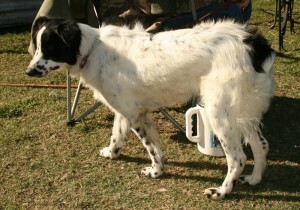 Dogs with excess white markings, sometimes referred to as mismarks, or over-marked. Australian Shepherds with too much white are usually healthy(exceptions noted below). 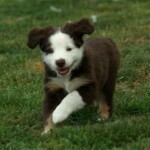 There are entire breeds that allow far more white than typical of Aussies. If a non-merle dog has excess white and at least one of its parents is not merle, the cause is some combination of spotting genes, which determine the amount of white trim. Parents of these dogs are carrying the gene(s) that resulted in the unacceptable markings.